– First, a chemical reaction takes place. The paint swells up (intumescence) and absorbs the heat, which is not transferred to the metallic profile. – Then, that volume expansion generates a kind of ash which covers the profiles and performs as an excellent thermal insulation that delays the reaching of its critical temperature. As already mentioned, these products start the protection once the intumescence has begun, unlike the passive products, which applies thermal insulation from the very first minute. This means that there is a different evaluation system for the results in both cases. The test standard for this type of reactive products obliges to test it on open profiles (IPN, IPE, HEB, etc), but also on closed profiles (circular or squared). The standard for passive products allows the test only on open profiles and a later correction factor for the closed ones. Another matter that is increasingly important is the type of solvent used in this type of products. The “-W” ending of our Teclack paint derives from the English word “Water”, since it is the solvent used in this case. This provides an ecological and environmentally sustainable advantage in relation to other solvents, since the Volatile Organic Compounds (VOCs) emission to the atmosphere is reduced. This is regulated by law in closed spaces and limited to the construction of buildings with the proper sustainability certification, like GREEN, LEED or BREEAM. This kind of intumescent paint usually requires a previous application base, an antioxidant primer. It is as much important as the application of the finish coat -for example, enamel-. This finish coat is essential to guarantee the durability of the product, since the intumescent paint is porous and absorbs the environmental humidity. This causes a rapid loss of its fire protection features if it is not applied, mainly in damp environments. Due to its high levels of solids, it is one of the best performing paints on the market. This means that we get the thickness required with the lesser quantity of product. Since the solvent is water, it is a product with low emission of VOCs, which has no toxic elements in its composition and, therefore, is much more respectful with the environment. 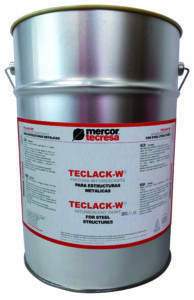 The product has been tested on a wide range of metallic profiles, both open and closed, which shows that Teclack-W® is the intumescent paint that reaches a higher mass range (388 m-1) and makes us unique in complicated high massivity profiles. 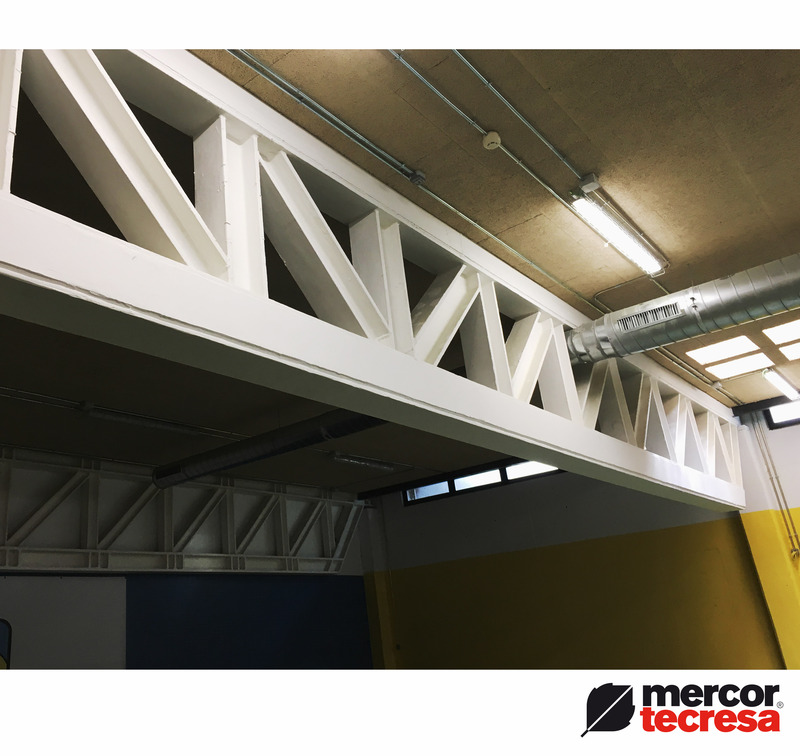 Teclack-W® Intumescent Paint reacts especially well on tubular profiles. We have the best thicknesses on the market for this type of profile. If you need more information about Teclack-W® Intumescent Paint, check the product data sheet or get in contact with our Technichal Department. We will clear all your doubts.